What is range bound? According to the Oxford English Dictionary it is “(Generally of market prices) not straying outside a particular range” ie: The US Mortgage Market has been range bound for about 15 months now. 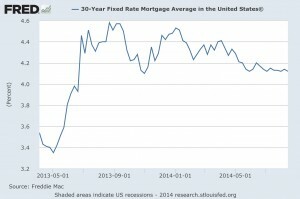 Average 30yr fixed mortgage rates bounced between 4.1% on the low side and 4.6% on the high side since about June of last year. It’s pretty rare for rates to remain within such a narrow range for so long. But, that doesn’t mean they can’t remain in this range for a lot longer than anyone, including me, thinks they will. The Federal Reserve is currently on pace to cease their massive bond-buying measure, known as Quantitative Easing, by their October 2014 meeting. The concern since the taper was announced in May 2013, has always been two-fold: Primarily that the Fed was the ONLY market for Treasuries and Mortgage Backed Securities. So, if they withdrew their purchases, who would buy them? Secondly, that the US economy was so weak that it needed the easy money policy to prime the economic pump. Those fears manifested in the rate spike, as seen on the graph above, in May last year. 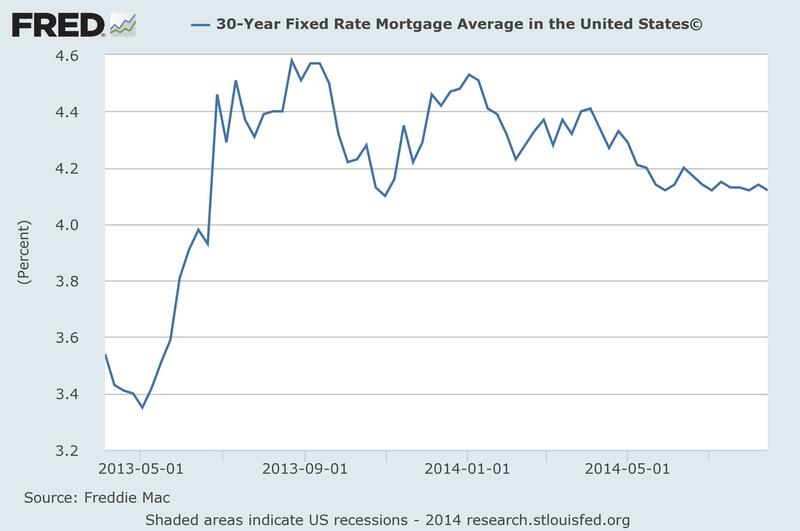 However, as you’ll further see, since then, rates have steadily drifted lower over time. Demand for US debt (whether Treasuries or Mortgage Backed Securities) has remained strong. At least as importantly, if you’re an institutional or government investor, and need to park some funds in a relatively low risk vehicle, to generate some returns, the US is still the best game in town. Sure, the yield on the 10yr US Treasury is only 2.4%-ish now, but… How ‘bout German Bunds? Less than 1%. Japan? A fraction of 1%, and so on. We’re the best horse in the glue factory, some might say. That could keep demand relatively high, keeping a lid on yields. Oh, and there’s that little rumbling of the EU beginning its own QE program, to spur inflation and/or drive off deflation, which would drive their rates down further, relative to ours. Furthermore, Mortgage Backed Securities – despite offering more risk – offer a pretty handsome return, relatively speaking, too. Perhaps more so in light of underwriting guidelines that strive to address a borrower’s ability to repay. So it seems the demand is likely to remain steady, at least for the foreseeable future. Economically, the US, Canada and Mexico appear to be doing pretty well, particularly relative to the rest of the world. Will that help recoveries take hold across the globe, or are we just one significant shock from slipping back towards or into recession? In my view, the US economic picture definitely seems to be improving. Employment figures are looking stronger, whether by the unemployment rate, numbers of people quitting (presumably for better jobs) and in some sectors there is even a bit of upward wage pressure. Corporate earnings are strong. The housing market is plodding along after seeing another round of fairly ridiculous appreciation in many places, over the last 24 months or so. Personal and corporate balance sheets are largely improved, and debt levels are relatively low. If all those trends continue, the US should enter a period of reasonable (3%+) GDP growth, annually. Yes, that would be below trend of prior recoveries, but those prior downturns were not of the deleveraging style we just had. The bigger question is whether the US economic recovery can help rev up economic engines around the world. In the recent past economists have theorized that the US economy can, and will, drive that of the world. The saying was, if the US catches a cold, the rest of the world gets the flu. Likewise, if the US is feeling strong, that will help strengthen other nations’ economies. On the other hand, there’s also been speculation that as other economies mature, they’re less dependent upon the US, and that the world is increasingly “decoupled” so a US recovery may not expand beyond its borders. My best guess it that regardless of any direct link, the economic recovery in the US will continue to strengthen. As will those in the Eurozone, and elsewhere. Economic cycles are exactly that. Cycles. They’re not going to move in a straight line in any direction. Certainly the EU has some greater challenges still ahead of it, but I don’t believe anything that will send their member states into economic ruin, nor dismantle the EU experiment. If anything, I see them forming a more solid union, leading to something more along the lines of the United States of Europe. China may have some issues and struggles as they continue to shift more to a domestic consumption model of economic growth, but when they’ll materialize and at what force, is anyone’s guess. I don’t see any massive disruptions from China, in the near term, at least. The larger question is how long will the current divergent economic paths between the US, Germany, the other EU member states, and other countries around the globe continue? Germany definitely appears to have hit a soft patch. They’d previously been the engine of the EU’s economic recovery. Historically, there’s been a fairly strong correlation between German Bunds and US Treasury yields. Currently, that spread is the widest it’s been in 15 years (Susanne Walker, Bloomberg, August 25, 2014). That could mean that if Bunds drift lower, Treasuries may follow. On the other hand, if the German and EU economies begin turning the corner towards more sustained growth, perhaps they’ll rise, closing the gap that way. The fear is that the EU may already be too late to fight deflation. The EU didn’t pull out the QE playbook as quickly as Bernanke and the Federal Reserve did. They’re threatening to open it now, but have yet to do so. If they do slip further into economic stall mode, and begin printing money as the US did, what level of impact will that have? Will it simply distort further the relationship between German Bunds and US Treasuries, or will it pull treasuries down along with German Bunds? The good news? So far, inflationary pressures in the US remain anchored, while slowly creeping towards the Fed’s target of 2%. That means there’s no hurry for the US to begin raising rates while the EU and their member states drive theirs lower. That buys the Fed time to sit, continue watching key economic metrics and try to communicate to the markets what they’re seeing and when they perceive they’ll need to begin taking the next steps of normalizing monetary policy. Most people project an increase in the Federal Funds Rate around this time next year. I’m thinking that may be further out, still. Lastly, there are always potential geopolitical tensions that can/will flare up. There’s the Middle East, with hot spots in Iraq, and Syria exacerbated by the rise of ISIS. There’s the never ending Israeli and Palestinian conflict. The Ukrainian conflagration w/ Russia continues to percolate. And, less publicly covered, China continues flexing its muscles within the Asian sphere. What role each of those factors will play in the direction interest rates take, is anyone’s guess. We’ve basically been at ridiculously low rates for about five years now. Enjoy ‘em while we’ve got ‘em. I’m still working on my better crystal ball, to help me predict the future with more accuracy. So far, I’m not making much progress. I’m open to suggestions anyone may have though.